The CCIAG is governed by a Steering Committee which sets the goals of the CCIAG, prepares its projects, and coordinates its actions. The Steering Committee maintains the accounts of the CCIAG, and insures the sustainability and efficiency of the CCIAG. 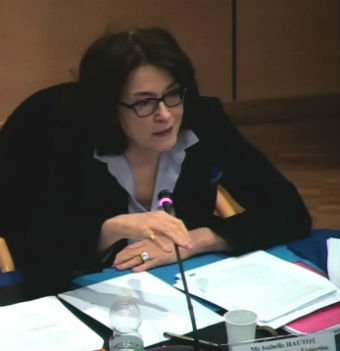 The current Chair of the CCIAG is Ms. Isabelle Hautot. The Steering Committee is elected by the CCIAG membership from among the members. All Steering Committee Members sit on the Committee on a pro bono basis. Roland Schroeder is Senior Counsel, Litigation and Legal policy at General Electric Company. He previously practiced with Sherman & Sterling in Washington D.C and has more than 20 years of experience in litigation and arbitrating complex international commercial disputes. He is a founding member of the CCIAG, a member of CPR’s Executive Committee, a member of the ICC Commission on Arbitration and Co-Chair of the Corporate Counsel subcommittee of the USCIB. Pierre-Jérôme Abric is Vice-President and General Counsel for the AREVA Group in charge of the Litigation department. He is training to become a CMAP certified mediator and is also a member of the AFJE (Association Française des Juristes d’Entreprise). Isabelle Hautot is General Counsel Group Litigation at ORANGE (International Expertise & Conflicts Resolution, Litigation, CSR, Real Estate). She has over 35 years of experience in international arbitration, as counsel, in-house counsel and arbitrator. She is a Director of the IMI (International Mediation Institute), a Director of the ASA (Association Suisse de l’Arbitrage) and an honorary member of the Paris Bar. Jean-Claude Najar is the founder and an honorary member of the CCIAG. He has joined Curtis Mallet-Prevost LLP in 2013 in their Paris and Istanbul offices. Prior to joining Curtis, he worked as in-house counsel at General Electric for close to 24 years where he held senior positions. He was awarded a lifetime Outstanding Achievement Award by Kluwer and the Iberian Lawyer magazine in 2012 for his advocacy on behalf of in-house counsel participation in arbitration. David H. Burt is Corporate Counsel for DuPont, responsible for commercial litigation, international arbitration and other forms of ADR. He has arbitrated in the US, Asia and Europe and has achieved many commercial dispute settlements through mediation. He leads the team advising DuPont’s 200+ lawyers in planning and executing alternative conflict resolution worldwide. He is co-chair of the Executive Advisory Committee to the International Center for Conflict Prevention and Resolution (CPR), and also has chaired CPR’s Mediation Committee. Andrew T. Clarke is General Counsel of ExxonMobil International Limited in the UK. During his 28 years with the company, he has spent 16 years working in several other countries, both as a lawyer and as a business developer. He is a director of the London Court of International Arbitration (LCIA), a member of the Advisory Council to the Centre of Commercial Law Studies at Queen Mary University of London, a Bencher at Middle Temple and a former chair of the CCIAG (2009-2010). Jean-André Diaz is Special Counsel at the Legal Department of Total’s Exploitation and Production branch. As a legal director he was in charge of negotiating and enforcing energy related contracts worldwide; he was thus regularly involved in various international arbitrations. He is also the former chair of the Oil and Gas Law Committee of the IBA, and the former chair of the CCIAG (2011-2012). Ute A. Joas Quinn is Associate General Counsel at Hess Services UK ltd. She is qualified as a U.S. attorney and trained as a mediator, Ute has a wide range of experience in conflict management, including (among other things) ADR and community grievance mechanisms. In her current role, she leads legal upstream operations in Europe, Middle East, Africa and Russia/Caspian. She is also Vice Chair of the IBA Corporate Social Responsibility Committee and the current chair of the IMI (International Mediation Institute). Dr. Angela Koelbl heads the Corporate Litigation Energy team at Siemens A.G and is based in Erlangen, Germany. She studied law in Marburg (Germany) and Adelaide (Australia) and holds a PhD from the University of Marburg. Angela began her career as an associate in Hogan Lovells’ dispute resolution practice before joining the Siemens litigation department in 2010. She holds lectures on negotiation management and mediation at the University of Marburg and the University of Heidelberg. Wolf von Kumberg has been the European Legal Director and Assistant General Counsel to Northrop Grumman Corporation and its predecessor, Litton Industries, Inc., for over 15 years. He is in addition a Fellow of the Chartered Institute of Arbitrators and a member of its Practice and Standards Committee, a member of the Board of Management and a Director of the American Arbitration Association (AAA). He is also a member of CPRS European Advisory and Steering Committees and sits on the board of the International Mediation Institute (IMI).